CAD-CAM software is used CNC Machine Shops around the world for its advantages in CNC metalworking, streamlining production and toolpath machining capabilities that keep them lean and profitable. In the past 20 years global economies have seen consumer products manufactured and delivered to market faster and for less than ever before. This is partly due to the explosion in manufacturing automation and CAD-CAM. It is easy to say that strong CAD-CAM advantages include increased productivity and a streamlined workflow for your CNC manufacturing process that can literally increase performance and production by up to 50%. However there are more CAD-CAM advantages that go even deeper into successful manufacturing. Here are 10 of the top advantages that your manufacturing business can achieve by adding CAD-CAM software to your CNC toolkit. #1. Increase Programming Potential. By adding CAD-CAM software to your CNC toolkit, you can open up possibilities for your business that may not have been there before. An example of this is gaining the ability to take on harder, more complex 3 Axis machining jobs. 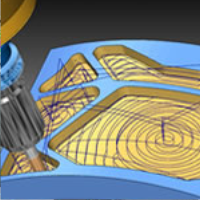 CAD-CAM can help a shop manage and create toolpath and NC programs for complex machining projects such as mold work. These types of jobs are next to impossible to calculate by hand or even through using machine canned cycles. A CAD-CAM system completely automates the process. #2. Makes You More Accessible by Clients. By using CAD-CAM in your shop, you have the advantage of receiving CAD models from clients faster and easier than ever before. 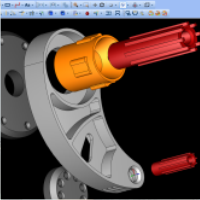 You can open CAD files easily, setup machine toolpaths and perform simulations that provide valuable information for you in the quoting process such as the calculation of cycle times. Manufacturing can deliver products to market faster and more affordable than ever before. This has a lot to do with technological advancements in CNC machining and in CAD-CAM technology. The software allows users to design faster, manage projects, test and simulate and machine faster than ever. #3. Improved Control Over Job Programming. 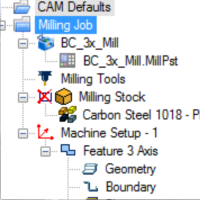 CAD-CAM functionality includes a CAM Tree Manager that allows you to manage jobs from beginning to end. You have full control over post processing, stock, work coordinates and tooling as well as access all available machining operations that determine how the part will be machined as well as the output of the NC Program. A CAM Tree has many advantages such as saving and loading machining templates, copying and pasting machining operations, reordering how the job is sequenced, toolpath associativity so that if a CAD edit is made to the part, all of the toolpaths are updated and much more. These higher control capabilities lead to perfectly finished parts consistently. #4. Machining Wizards Remove The Guesswork. CAD-CAM provides the automation required to maximize programming efficiency. Machining wizards remove the guesswork from programming as they step the operator through the process of setting cutting depths, selecting tools, choosing toolpath styles, managing cutter lead-ins and lead-outs, choosing compensation settings as well as many other important parameters that have to do with creating machine toolpath. Wizards allow new programmers to be successful faster while still providing advanced programmers with the utilities and confidence to program error free parts regardless of their complexity. #5. Getting The Most Out of Your CNC Machine Tool. 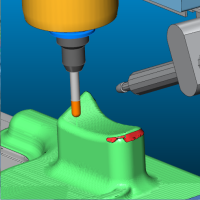 CAD-CAM software provides high-speed machine toolpaths that deliver a host of benefits that all equal up to reduced cycle times, less tool wear and a reduction in machine wear and tear over the long term. High-speed toolpaths allow you to improve the quality of cutting by eliminating the stop and go actions that traditional offset toolpath creates. The rounded more circular cutting motions at higher speeds allow a constant tool engagement with the material, deeper cuts and the ability to use more of the cutting tool itself. High speed machining can improve CNC machine productivity by as much as 50%. #6. Eliminate Costly Mistakes & Waste. CAD-CAM software provides powerful simulation features. 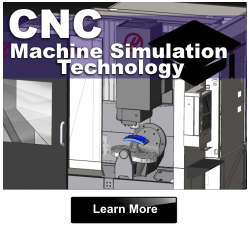 Simulation advantages allow you to visually inspect the machining process, catch costly tool gouges and collisions before they reach the CNC machine. This alone makes adding a CAD-CAM product to the shop a good decision. 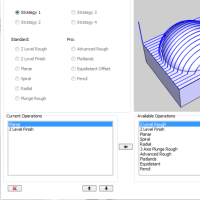 Simulation also provides detailed information about the toolpath, cycle times, part deviation analysis, the ability to create simulation presentations and much more. Higher levels of simulation will allow you to use your machines kinematics to simulate machining with the actual machine tool visually. Work holding can also be modeled and added to simulation to complete the visual inspection of the part being machined as well as everything else involved. #7. Powerful 3 Axis CNC Programming Operations. 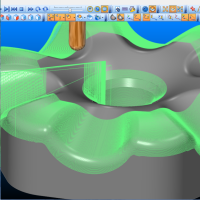 CAD-CAM software provides the important advantages of creating complex 3 Axis machine toolpath quickly and efficiently. Without CAD-CAM, programming complex 3D parts is practically impossible as often time there are multiple toolpaths required from advanced roughing, semi-finishing and then multiple finishing toolpath strategies. 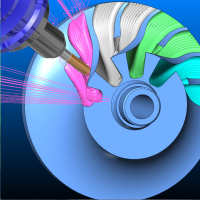 In addition, the latest releases of BobCAD-CAM provide Dynamic Machining Strategies™ allowing the programmer to apply multiple roughing and finishing operations to a single CAD feature. #8. Multiaxis CAM Technology Makes Complex Machining Simple and Cost Effective. Simultaneous 4 and 5 Axis CNC machining can be the most difficult to create NC programs for. CAD-CAM software provides the solutions to make these types of CNC jobs much easier than ever before. This starts with 4th Axis indexing and rotary machining jobs that require toolpath and special post processing that only a CAM system can offer. Posting can even be customized by the operator with a little training for a wide variety of 4 and 5 Axis machines. Full 5 axis toolpaths include surface-based machining operations that accommodate port milling, SWARF and undercutting type toolpath strategies as well as 3+2 programming. #9. Turn Art Into CNC Programs & Finished Parts Easily. 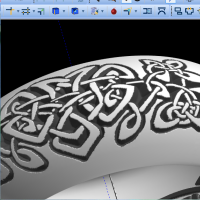 Artistic CAD-CAM technology has evolved to support a wide range of custom applications. Two of these specialized industries would be the custom woodworking and jewelry making industry. These types applications require the ability to turn a picture into a 3D relief model that can be machined in a variety of ways. This also includes the ability to turn a picture into 2D profiles that can be used for engraving, pocket milling and profile milling. These industries have to then be able to create these programs to me machined on a CNC Mill or Router in 2, 3 and 4 Axis. Some even require 5 Axis CNC programming capabilities. Whatever the case, CAD-CAM providers now offer artistic modules that can be added on to a machining product for creating amazing artistic CNC parts. #10. Seamless Integration with Popular CAD Design Products. Some CAD-CAM providers have teamed up with highly popular CAD vendors such as SOLIDWORKS® to create powerful CAM machining modules that integrate into the CAD software as a plug-in. This allows existing CAD users to create the necessary machining for the part, simulate everything and create the NC programs for them. This is highly beneficial, as the CAD users do not have to completely re-learn a new CAD-CAM system; they only need to learn the machining side. By going this way, a CAD Designer can acquire more value and seek more clients for being a full service design and programming facility. Typically CAM products that plug-in to CAD systems can be easier to learn and use after some training. View this presentation to understand more about 10 of the top advantages to adding CAD-CAM software to your CNC metalworking toolkit and share it with your friends and colleagues! These top 10 CAD-CAM advantages are key contributors that help determine the success of a CNC machine shop when it comes to using a CAD-CAM system to stay competitive, productive and profitable. 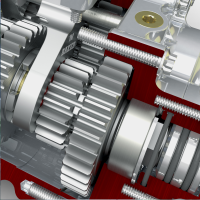 While CAM technology continues to advance and become faster, smarter and easier to use, BobCAD-CAM remains a world leader in providing powerful and affordable CAD-CAM products as well as Gold partner CAM add-ons to SolidWorks. 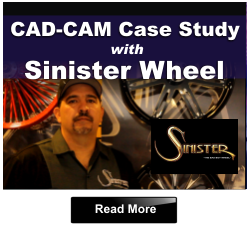 For more information on CAD-CAM for your CNC business contact BobCAD-CAM at 877-262-2231 or 727-442-3554. You can also download a free trial HERE!